A scenic route has helped to increase tourist visitor numbers to places on Scotland's north west mainland coast, according to VisitScotland. The North Coast 500 route, also known as the NC500, stretches for 500 miles. North Highland Initiative promotes the NC500 to holidaymakers seeking scenic road trips. VisitScotland said visitor numbers at its information centres (iCentres) had increased by 30% in Ullapool, 27% in Durness and 25% in Thurso. The visitor figures are from 1 April to 31 October this year and were compared to those from the same period last year. Scott Armstrong, VisitScotland's regional partnerships director, said: "I think it is safe to say that the NC500 has definitely brought additional visitors who wouldn't otherwise have come to the region. "As a result, there have been increases in visitor numbers at our iCentres in Ullapool, Durness and Thurso which are all on the NC500, proof I would say that the NC500 is indeed bringing extra visitors to the area." The NC500 features roads in the Black Isle, Caithness, Sutherland and Wester Ross. It includes several challenging ascents and descents, including the Bealach-na-Ba at Applecross. The unclassified road rises to about 626m (2,053ft) over about four miles (8km). North Highland Initiative encourages responsible driving of the route. However, Highlands and Islands Labour MSP David Stewart, while describing the route as a "brilliant concept", has suggested it needs a 10 year-long strategic plan to ensure the roads involved can cope with increased traffic. 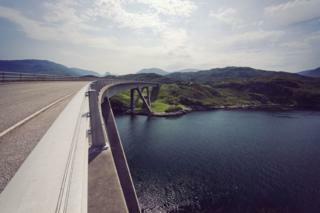 The NC500 is also regarded as a challenge for endurance cyclists. In May, seven women cyclists set a time of 36 hours to complete the route in a non-stop team time trial. The seven included Commonwealth Games cyclists Lee Craigie and Anne Ewing and British 24-hour mountain bike champion Rickie Cotter. The other riders were author and travel blogger Emily Chappell, transcontinental cyclist Gaby Leveridge, plus Zara Muir and Jo Thom, winners of the women's pairs event at this year's Strathpuffer endurance ride near Strathpeffer. Scottish endurance cyclist Mark Beaumont previously completed the NC500 solo in 37 hours 58 minutes. Edinburgh cyclist and Commonwealth Games rider James McCallum also beat Beaumont's time after completing the route in June.